Essentially you are whisking the egg and sugar together... adding warmed heavy cream or half & half... and returning it to the heat to thicken. 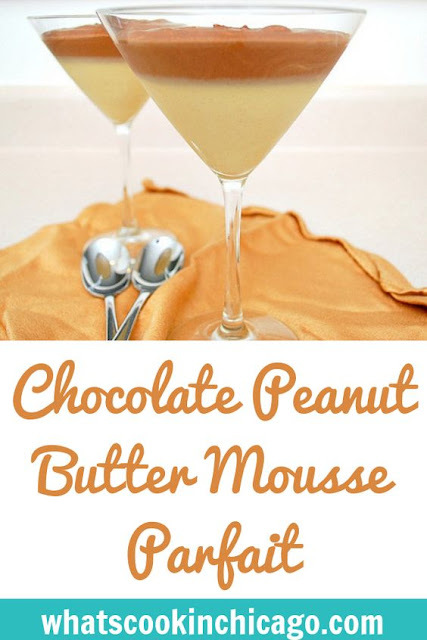 For the peanut butter mousse, you add peanut butter and dissolved gelatin to the warmed egg+heavy cream mixture. 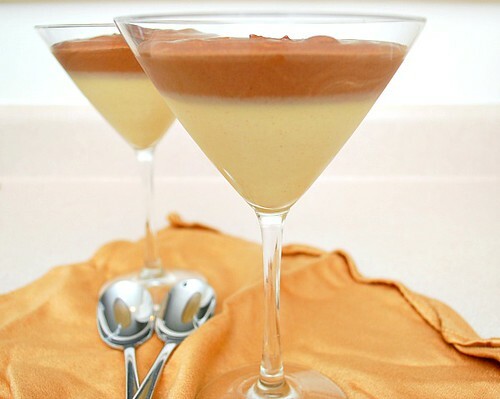 For the chocolate mousse, you pour the warmed egg+half & half over chocolate, allow to melt and stir to combine. Transfer it to a serving glass in alternating layers and chill until set. My initial plan was to add a dollop of freshly whipped cream and a sprinkling of crushed pretzels on top. But The Baron and I couldn't wait for that extra touch. Besides, it really didn't need it, but if you wanted to, I would recommend it for something over the top! In a bowl, dissolve the gelatin in the water and let stand for 5 minutes. In a saucepan, cook the cream over moderately high heat until it bubbles around the edge. In a medium bowl, whisk the egg yolks with the sugar. Gradually whisk the hot cream into the egg yolks. Pour the mixture into the saucepan and cook over moderately low heat, stirring constantly, until thickened, 3 minutes. Remove from the heat and whisk in the peanut butter, followed by the gelatin. Scrape the peanut butter mixture into the bottom of six 12-ounce jars or parfait glasses and refrigerate for 1 hour, until set. In a small saucepan, heat the half-and-half until it bubbles around the edge. In a medium bowl, whisk the egg yolks with the sugar. Gradually whisk the hot half-and-half into the egg yolks. Pour the mixture into the saucepan and cook over low heat, stirring, until thickened, about 2 minutes. Place both chocolates in a medium bowl. Pour the half-and-half mixture over the chocolate and let stand for 1 minute, then whisk until completely melted. In a chilled bowl, whip cream into medium peaks. Transfer whipped cream to bowl with chocolate. Fold in the whipped cream to combine. Pour the different mousse in a serving glass in alternating layers; chill until set and serve.